White Rock Minerals (ASX:WRM) has capped off a successful first year of exploration on the ground at its highly prospective 100% owned Red Mountain high-grade zinc-silver-lead-gold-copper volcanogenic massive sulphide (VMS) Project in Alaska by more than tripling its landholding. Just last week WRM announced that it had strategically expanded the project area at Red Mountain, staking a number of additional high grade zinc-silver-lead-gold-copper VMS deposits. The group staked an additional 524 new State of Alaska Mining Claims and Mineral Locations, with the total area controlled at Red Mountain now standing at 475 square kilometres (117,000 acres), giving WRM a dominant position in the region. The decision delivers first mover status in an underexplored area which has already delivered positive exploration results. WRM made the decision to secure the additional prospective areas in consultation with its strategic partner, the $1.07 billion-capped copper-gold producer, Sandfire Resources NL (ASX:SFR). WRM secured SFR as a cornerstone investor and strategic partner earlier this year, positioning it to benefit from SFR’s significant technical expertise to develop its flagship Red Mountain Project. WRM’s Red Mountain Project is a globally significant zinc and precious metals VMS Project with a maiden high grade Resource of 9.1Mt at 12.9% ZnEq delivered only last year, and which places it in the top quartile of undeveloped high-grade VMS (zinc, silver, gold) deposits globally. A modern exploration campaign is being undertaken at the project to increase the known zinc-silver-lead-gold Resource as well as to discover further deposits – aimed to generate strong results and a high level of news flow. With Sandfire involved, WRM is enacting a broader exploration and discovery vision by securing what’s believed to be a regionally extensive and highly prospective land package. Offering significant exploration upside in a highly prospective yet underexplored district, this region of central Alaska hosts multi-million ounce gold and multi-million tonne base metal deposits. For example, the 4Moz Pogo gold mine, recently acquired by ASX-listed Northern Star for US$260 million, is less than 140 kms from Red Mountain, as is the well-known Fort Knox gold mine run by Kinross. The world’s largest zinc mine – Red Dog – run by Teck, is also in Alaska. Yet, at the same time, WRM’s share price remains at less than one cent per share, with a sub-$10 million market cap, suggesting there’s plenty of upside potential. 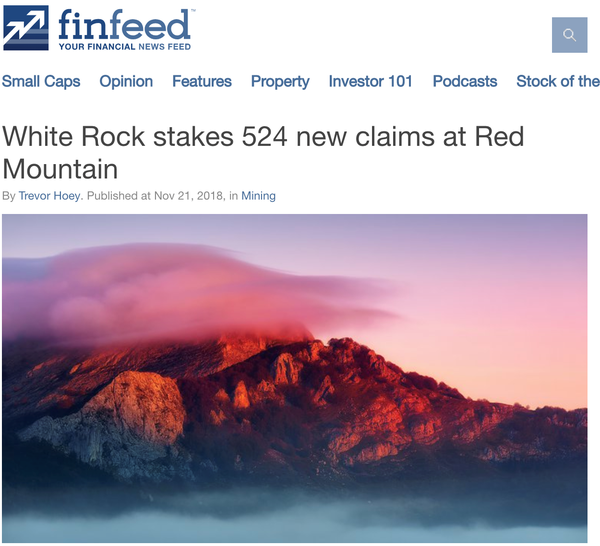 White Rock Minerals (ASX:WRM) has made serious strides since we last updated you on the company back in July with the article, New Massive Sulphide Mineralisation at WRM’s Red Mountain High-Grade zinc Project. Since then the company has partnered with the $1.07 billion-capped Sandfire Resources NL (ASX:SFR), successfully completed its first on-ground exploration season, and significantly expanded its landholding at the Red Mountain VMS Project in Alaska. While Red Mountain is where much of the recent action has been, it’s not the only project on WRM’s books. It has another project in its portfolio that’s located in northern New South Wales — the 100% WRM owned Mt Carrington gold-silver project that’s underpinned by a JORC Resource estimate containing over 340,000 ounces of gold and 23 million ounces of silver, and has a PFS and a JORC Reserve on the Gold First Stage of this project. WRM has received several enquiries from parties interested in possibly participating in advancing the Mt Carrington project with site visits and access to the company’s on-line data room arranged. That said, the company’s (and our) focus is squarely on the Red Mountain VMS Project in Alaska, especially as Alaska is grabbing headlines as the mining destination to be. Encouraged by what WRM was doing at its high-grade Red Mountain zinc-silver-lead-gold project in Alaska, in July Sandfire Resources NL (ASX:SFR) became a strategic partner and cornerstone investor. SFR signed an agreement providing equity funding to assist WRM to continue to explore the project during the 2018 season, with an option to enter into an earn-in JV by the end of this year. The first stage involves SFR funding a minimum total of $20 million over four years to earn 51%, with a minimum expenditure by SFR of $6 million in year one (2019). The second stage involves SFR funding a further $10 million and delivering a pre-feasibility study over an additional two years to earn 70%, which may be extended by SFR for a further year in certain circumstances. In the third stage, WRM may elect to contribute to the joint venture. If it chooses to not contribute, SFR can solely fund Stage 3 to earn 80% by completion of a definitive feasibility study. This deal was followed up in August with Sandfire providing an additional $1 million in funding to WRM, made up of two loans of $500,000. The deal positions WRM to benefit from Sandfire’s significant technical expertise to develop the Red Mountain Project as well as delivering further strategic support as the company moves to unlock the potential from its large strategic land holding. Sharing WRM’s vision for the exploration and development of the Red Mountain Project, Sandfire is now a 12.7% shareholder and a decision will to be made by the end of the year as to whether it is to become a joint venture partner in WRM’s Red Mountain Project. WRM has more than tripled its landholding and staked a number of additional high grade zinc-silver-lead-gold-copper Volcanogenic massive sulphide (VMS) deposits at Red Mountain. The VMS mineralisation is located in the Bonnifield District, in the western extension of the Yukon Tanana terrane. The company last week reported that it has expanded its strategic landholding at its highly prospective 100% owned Red Mountain Project through the staking of an additional 524 new State of Alaska Mining Claims and Mineral Locations bringing its total to 754. The majority of the expanded tenement area forms a contiguous block of mining claims that now extend the Red Mountain project over a larger area of the Bonnifield Mining district, to the west along strike and south into the prospective footwall stratigraphy identified as containing multiple VMS prospective time horizons. 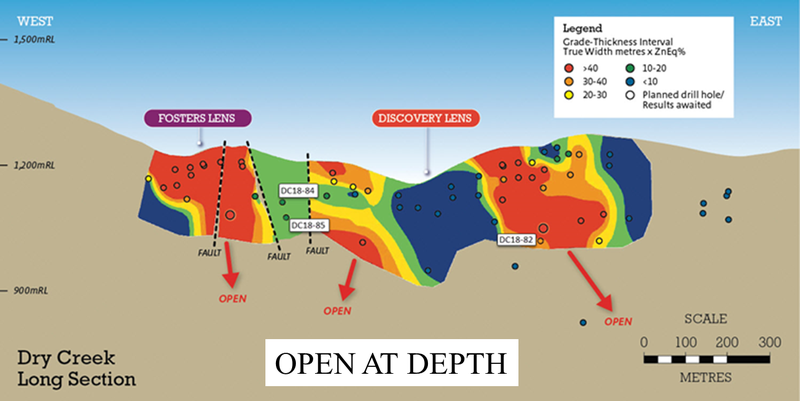 These new claim areas will allow WRM to systematically explore this highly prospective regional stratigraphic setting that’s capable of hosting multiple high grade zinc-rich polymetallic VMS deposits. With the additional 524 claims, the project now comprises 754 State of Alaska Mining Claims and Mineral Locations, with the total area now controlled totalling 475km2. WRM’s staked claims include a number of additional VMS mineral occurrences including at Anderson Mountain, Virginia Creek, West Fork, Peaches, Keevy Peak, Kenny, Sheep Creek and Surprise Creek. 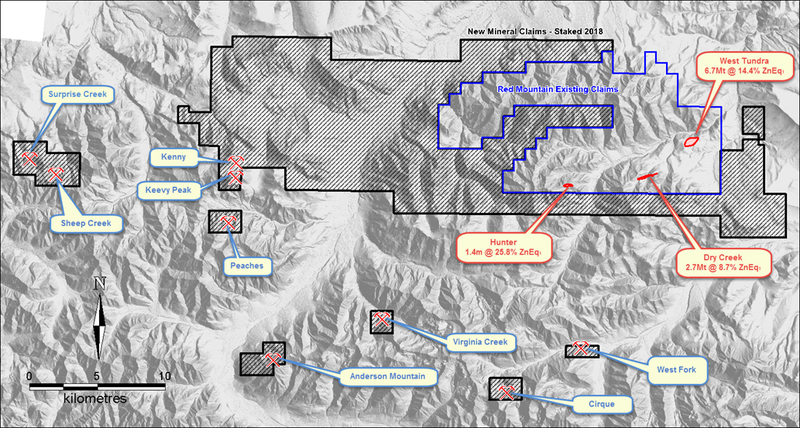 Red Mountain Project tenement outline on terrain map with locations for the Dry Creek and West Tundra Flats VMS deposit Mineral Resources, the new discovery at the Hunter Prospect and outlier VMS prospects. AM-76-2 intersecting 1.7m at 8.5% zinc, 2.1% lead, 61g/t silver and 1.2% copper from 60.4m. AM-76-3 intersecting 0.6m at 22.0% zinc, 4.8% lead, 161g/t silver and 0.6% copper from 42.0m. 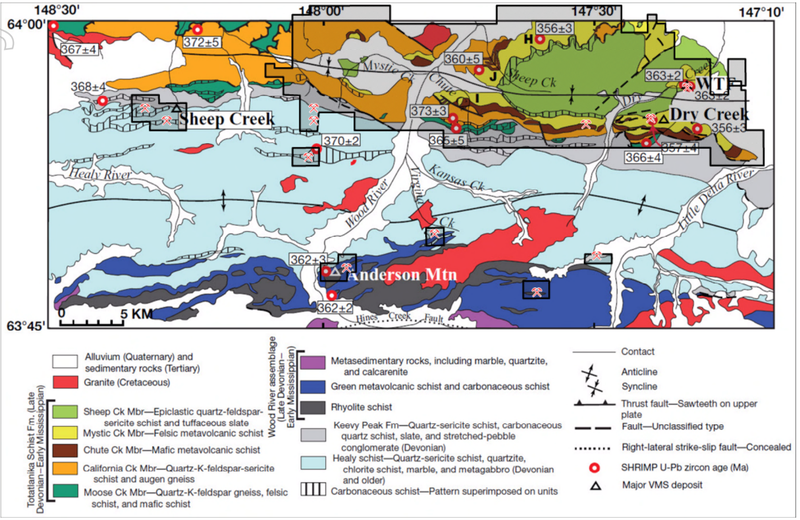 Massive sulphide zones extend for 1200 metres SW-NE and are hosted by black graphitic argillites within a Devonian sequence of metasedimentary and metavolcanic rocks document massive sulphide layers up to 3m thick with assays up to 22% zinc, 5% lead, 170g/t silver and 19% copper. The most recent work in 1998 saw a further 10 drill holes with the highlight from AM-98-6 that intersected 0.9m at 16% zinc, 5% lead, 102g/t silver, 0.8g/t gold and 0.4% copper from 42.4m. The Virginia Creek prospect was also discovered in 1975. Records indicate that four of six drill holes successfully intersected sulphide mineralisation along 300m of strike within 45m of surface, with the highlight from VC-2 intersecting 14.8m at 3.3% zinc, 0.8% lead, 78g/t silver, 0.2g/t gold and 0.5% copper. The Sheep Creek prospect (also known as the Last Chance or Gossan Peak prospect) was another discovered in 1975. 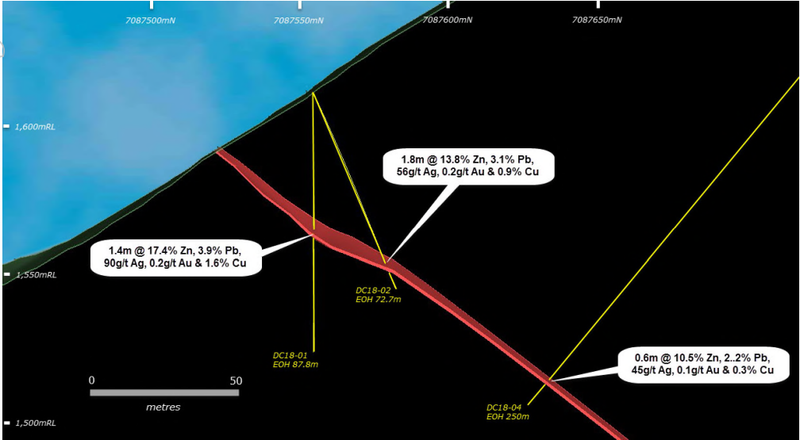 The discovery exposure at Gossan Peak extends over 200m of strike and is up to 100m wide with anomalous prospect sites defining a three kilometre long east-west target horizon. Mineralisation at Sheep-Surprise is distinct from the other VMS prospects in the district as it is sediment hosted with no clear volcanic affinity. The prospects have significant concentrations of tin (Sn) and indium (In). Later samples included up to 11% combined zinc and lead, 10g/t silver and 1% tin from massive sulphide lenses within more broadly disseminated sphalerite-galena-cassiterite (zinc-lead-tin) stratabound mineralisation hosted by siliceous sediments. The Cirque prospect was also discovered in 1976. Massive sulphide float blocks up to 2 metres thick occur within 300m of mineralised calc-schist and carbonate outcrop. 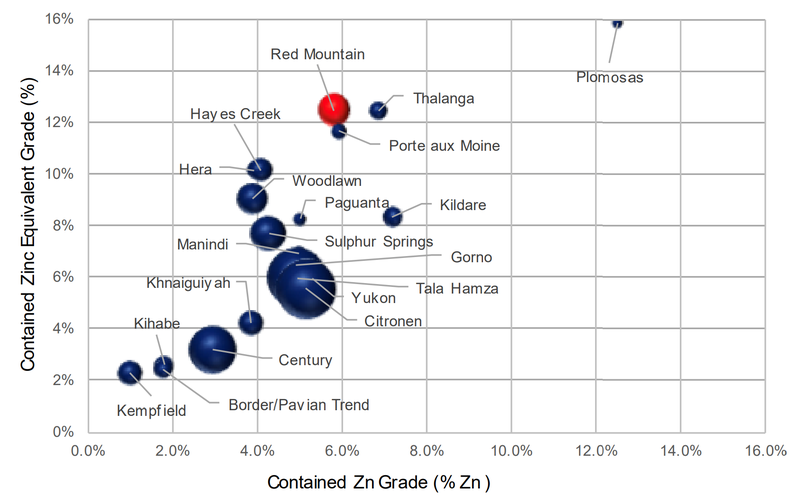 Assays for 18 samples averaged 5.6% zinc, 1.7% lead, 49g/t silver and 0.5% copper. The West Fork prospect was also discovered in 1976 and further explored in 1998. Massive sulphide mineralisation at surface returned rock chip assay results up to 12.3% zinc, 5.4% lead, 93g/t silver and 1.4% copper, with a footwall of gossanous felsic metavolcanics delineated by a 1200m copper-lead-zinc-silver soil geochemical anomaly that trends E-W. The Peaches prospect was also discovered in 1976 and further explored from 1996-1998. Surface rock chip sampling assayed 6.9% zinc, 6.3% lead, 88g/t silver, 1.2g/t gold and 0.1% copper. Back in April 2017, WRM used historical drilling to determine a Maiden JORC 2012 Mineral Resource estimate for the Dry Creek and West Tundra Flats deposits. The Inferred Mineral Resource contains an impressive base metal and precious metal content with 678,000 tonnes zinc, 286,000 tonnes lead, 53.5 million ounces silver and 352,000 ounces gold. With the expanded project area, which has demonstrated high-grade zinc, silver, lead and gold mineralisation, there will be numerous opportunities to increase this Resource. Management envisages an aggressive systematic multi-pronged exploration program that will rapidly yield the discoveries required to advance the Bonnifield district towards a new VMS development project. As well as giving WRM a dominant landholding, this expansion of its landholding at Red Mountain offers first mover status in an underexplored area which has already delivered positive exploration results. Importantly, WRM's strategic joint venture partner Sandfire Resources supports the company’s acquisitions. The expanded landholding caps off a successful first year of field activities for WRM at Red Mountain, where drilling intersected multiple high-grade intervals of zinc-silver-lead-gold-copper mineralisation at Dry Creek, West Tundra, and the newly discovered Hunter prospect. A total of 24 drill holes for 4111 metres of diamond core drilling was completed during 2018. 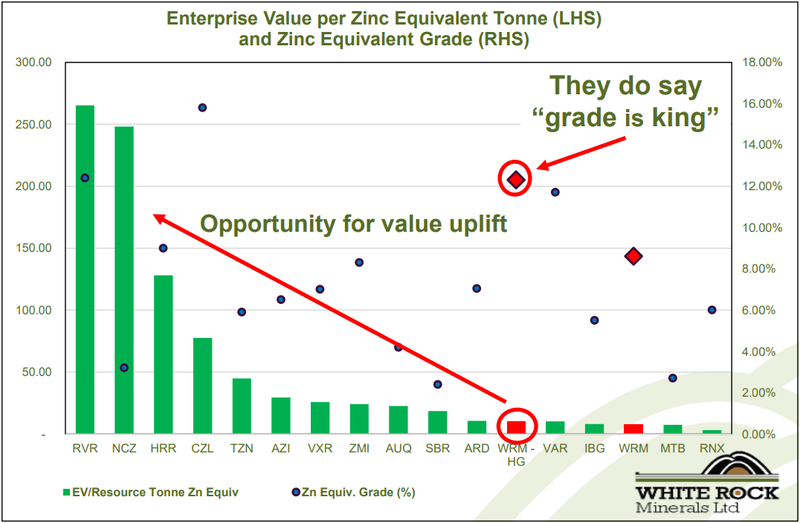 Some of the drill hole results returned in excess of 17% zinc, 6% lead, 1000 g/t silver, 6 g/t gold and 1.5% copper, with nine of the holes drilled returning grades in excess of 10% ZnEq, and three of these greater than 40% ZnEq – a great return in only their first field season. The season also saw three reconnaissance crews out in the field mapping and sampling. This drilling confirmed that the two known deposits remain open down dip and in places along strike, offering great potential to add to the already significant resource. The culmination of this work has encouraged WRM to expand its strategic tenement holding to take in more of what has been identified as a highly prospective geological setting. One of the highlights of the 2018 field season, which concluded in September, was the discovery made at the Hunter prospect, located five kilometres west of the Dry Creek deposit. VMS deposits tend to occur in clusters so the first result from the new Hunter Prospect was certainly encouraging. This result included the discovery and successful drill testing of the Hunter prospect massive sulphide mineralisation, with 1.4m at 17.4% zinc, 3.9% lead, 90g/t silver and 1.6% copper for 25.8% ZnEq. This discovery remains open east and west and down dip with massive sulphide mapped for over 500 metres along strike on the surface. WRM also reported the best drill intersection in the history of the project at the West Tundra deposit with 3.5m at 15.1% zinc, 6.7% lead, 518g/t silver, 2.1g/t gold and 0.2% copper for 35.2% ZnEq. It also recorded the best drill intersection in the history of this project into the Discovery Lens at the Dry Creek deposit with 4.7m at 19.5% zinc, 7.8% lead, 466g/t silver, 6.9g/t gold and 1.5% copper for 49.7% ZnEq. Down dip extension of the Fosters Lens at the Dry Creek deposit was achieved with 4.3m at 4.8% zinc, 2.3% lead, 1,435g/t silver, 2.2g/t gold and 0.5% copper for 43.2% ZnEq and remaining open down dip. Successful orientation ground geophysics across known mineralisation with the CSAMT geophysics technique accurately identified massive sulphide mineralisation at Dry Creek and at West Tundra enabling the technique to be a rapid reconnaissance tool for identifying drill targets within zones of anomalous geochemistry and favourable stratigraphy. A comparison with WRM’s peer group suggests the company has significant share price re-rating upside potential. Particularly so as the ASX provides limited opportunities for exposure to zinc production and project development assets. Notably, this analysis excludes any upside from the exploration potential at Red Mountain, as well as no value being attributed to WRM’s Mount Carrington gold and silver Project in NSW. In September, the research team at Baillieu Holst highlighted the potential upside of WRM in a report to clients. The report noted WRM’s “combination of good board leadership, the option value of Mt Carrington and the exploration blue sky in Alaska makes WRM an interesting ASX exploration play and one that may get more attention following Northern Star’s acquisition of the Pogo mine in Alaska”. The broker compared WRM to a number of comparable Australian companies. 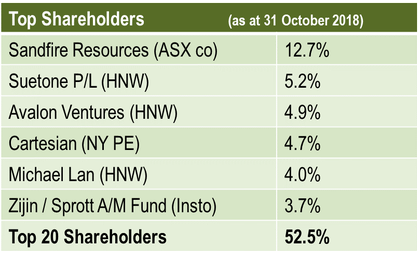 And while it revealed that it’s inherently difficult to come up with meaningful comparisons of polymetallic deposits at a varying stage of exploration and development, the broker looked at junior explorers on the ASX with comparable resources and at the companies under its coverage. Baillieu concluded that WRM ‘stacks up well when only considering Red Mountain and no exploration upside’. The success of WRM’s first on-ground exploration season at the Red Mountain VMS Project led to WRM’s decision, as supported by Sandfire, to expand its landholding by more than three-fold to cover a total area in the highly prospective region of 475km2. In light of the successful field season, and with drill hole results returning in excess of 17% zinc, 6% lead, 1,000 g/t silver, 6 g/t gold and 1.5% copper, the drill rig has been demobilised and stored at the camp site ready for rapid re-mobilisation in 2019. It was the successful progress of this exploration program that ultimately resulted in the signing of the cornerstone investment and strategic relationship agreement with Sandfire Resources, which shares WRM's vision for the exploration and development of Red Mountain. Securing a high-quality partner with world leading expertise in the exploration and development of base metals projects is a strong endorsement to the quality and potential of White Rock’s globally significant high-grade zinc VMS Red Mountain Project.